At Alamo Heights Chiropractic Health Center, we take great pride in providing the finest chiropractic wellness care to our patients. Below is a sampling of the different chiropractic services we offer in our San Antonio office. We provide advanced spinal correction utilizing "state of the art" chiropractic techniques. Never in the history of chiropractic have we been able to provide the level of help and expertise that now exists. These newer correction methods are even safer, more comfortable and more effective than ever before. As a Doctor of Chiropractic, Dr. Sandra Carrell Tremblay has years of training and experience in evaluating you and analyzing your test results. Our team approach ensures that we coordinate the care that you need together every step of the way, helping you reach your optimal health potential. Why? Because you deserve to live every day at your best so that you can enjoy and savor your life... for as long as possible. We teach our patients special "blueprint" exercises designed just for them to help strengthen and correct their own unique problem. All our exercises can be performed in the comfort of your own home and can improve the effectiveness of your spinal correction by as much as 30-40%. In addition to skeletal misalignment, muscles and connective tissues can be out of place or strained by improper alignment and use. Specific exercises and stretches can help your body stay in balance and in health. PowerPlate exercise is performed on a state of the art Olympic performance machine that vibrates on 3 different planes at the same time. This allows 95% of the muscle spindle to be challenged with every exercise or stretch you perform. Why is that important? Because we typically only incorporate up to 45% of the muscle fibers in any activty we do. For rehabilitation and strengthening weak muscles, stretching and elongating short tight muscles, it facilitaties productive and safe muscle fiber movement. Massage therapy is often the missing link to full recovery of many physical conditions. We work with spinal adjustments, massage therapy and fitness training to fully rehabilitate all previous injuries. Massage not only relaxes muscle spasms, but helps to elongate muscle fibers, allowing you to be able to hold your spinal adjustments, stretch and strengthen muscles in fitness training. Comprehensive testing and blood work is performed which thoroughly asses your condition and prepares you to start the innovative fitness trainingn for strengthening muscle and sculpting your body, nutrition and eating for life, chiropractic spinal adjustments for the most efficient brain to body nerve function so all systems are ready for the many changes you will experience, massage to relax well used muscles and treat you for all your hard work, meditation to decrease your blood pressure, and major accountability throughout the process so that your final tests and assessments will show your outstanding results. We then discuss your next goals and start on that process until you finally reach your goals. After that, we work to maintain your new health status, so that these changes become part of your every day life, leading you to a happier, more fulfilling and longer life. 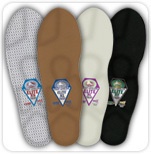 We use Foot Levelers high tech thermal scanned customized arch supports with a great report for our patients. Foot Levelers has been in business for more than 50 years and makes the highest quality supports on the market - and they are very affordable. Call 210 828-9211 to schedule your FREE scan. It just takes 5 minutes to get scanned and get your report! Orders take about 1 week to come in! Most adults and some children need arch supports to support !not only their feet, but their entire structural system.